My article on volume 6, number 2, of the journal Cliodynamics has recently been published; it is titled “Wheat flour versus rice consumption and vascular diseases: Evidence from the China Study II data” (). While this is an academic article, I think that the main body of the article is fairly easy to read. More technical readers may want to check under “Supporting material”, which is one of the links on the left, where they will find a detailed description of the data used and the results of some specialized statistical tests. In the past I have discussed in this blog the associations with vascular diseases, in the China Study dataset, of wheat flour and rice consumption. The interest in the possible effects of wheat flour AND rice consumption comes from the fact that these foods are similar in some important respects – e.g., they tend to raise insulin levels in similar ways. But as you will see in the article, their associations with vascular diseases are clearly different, particularly when we conduct nonlinear analyses. While I do not think that wheat flour consumption per se is particularly healthy, the results of the analysis go somewhat against the idea that wheat flour intake is the primary culprit with respect to vascular diseases. The results also go somewhat against the “insulin theory of obesity”, at least in a narrow sense, and call for a broader explanation that includes cultural elements. These points are further elaborated in the article. There is speculation in the article, and also a discussion of possible limitations. Do prominent health gurus live longer? Many years ago, when I started blogging about health issues, I noticed a couple of interesting patterns. The first pattern is that prominent health “gurus” often talk about having had serious health problems in their past, which they describe as having motivated them to do research on health issues – and thus become health gurus. Frequently these problems pop up before 45 years of age; this is a threshold beyond which there is a clearly noticeable increase in severity of health problems. In fact, I remember being somewhat surprised by one such “guru” (I will not name him), who would regularly write posts saying something to the effect that “… finally, my health is now on the right track …” In other words, every few months or so this person had to deal with serious health problems, always coming up with reasonable knowledge-based solutions. The knowledge seemed to be of good quality, but this guy’s health was poor to say the least. The second pattern, related to the above, is that prominent health gurus seem to have a below average life expectancy. The life expectancy for the general population is around 79 years of age in the USA at the time of this writing, according to the World Health Organization (). Anthony Colpo has written an interesting post about this below average life expectancy pattern among health gurus (). - The guru's health before age 45 (BEF45). - The guru's knowledge about health issues (KNOWL). - The guru's health after age 45 (AFT45). - The guru's prominence (GPROM). Finally, the variable below is on a continuous scale of years, with an average of 79 and a standard deviation of 10. As mentioned earlier, 79 is the life expectancy for someone living in the USA at the time of this writing. The standard deviation of 10, which approximates that figure in the USA, means that approximately 68 percent of the individuals in the simulated dataset will have a life expectancy between 69 and 89. That is 79-10 and 79+10, respectively. - The guru's age at the time of death (GAGED). - That the poorer is the guru's health before age 45 (BEF45), the greater is the guru's knowledge about health issues (KNOWL). The reason for this is that poor health compels the person to study about health issues. - That the poorer is the guru's health before age 45 (BEF45), the poorer is the guru's health after age 45 (AFT45). This assumes that the person has an underlying condition that causes the poor health in the first place, and that can be exacerbated by a poor diet and lifestyle. - That the greater is the guru's knowledge about health issues (KNOWL), the better is the guru's health after age 45 (AFT45). This counteracts the effect above, and assumes that the knowledge is put to good use and contributes to improving the person’s health. - That the greater is the guru's knowledge about health issues (KNOWL), the greater is also the guru's prominence (GPROM). In other words, a guru’s status among followers is enhanced by the guru’s knowledge. - That the better is the guru's health after age 45 (AFT45), the higher is the guru's age at the time of death (GAGED). 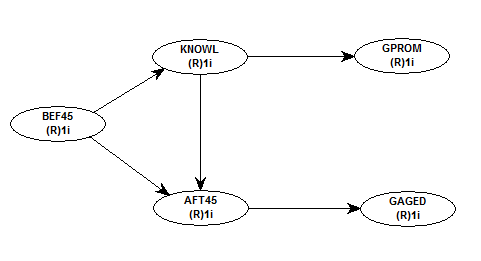 A final assumption made is that the causal relationships laid out above have a small effect size (more technically, that they are associated with f-squared coefficients slightly below 0.1), meaning that random influences are not only present but also play a big role in what happens in the simulation. The causality links are summarized in the graph below, created with WarpPLS (). We also used this software to analyze the data. Note that in our simulated data the guru's prominence (GPROM) does not directly influence the guru's age at the time of death (GAGED). 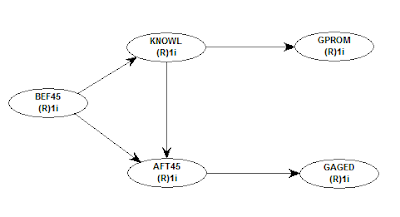 Stated differently, there is no causality link between GPROM and GAGED, one way or the other, even though these two variables are likely to be correlated due to the network of causality links in which they exist. Nevertheless, it is by looking at the relationship between these two variables, GPROM and GAGED, that we can answer the question in the title of this post: Do prominent health gurus live longer? And the answer appears to be “no” in our simulation. The plot below shows the relationship between a guru's prominence (GPROM), on the horizontal axis, and the guru's age at the time of death (GAGED), on the vertical axis. Each data point refers to a guru. On average, the greater a guru's prominence, the lower seems to be the guru’s life expectancy. Each one-point increase in prominence is associated, on average, with approximately a one-year decrease in life expectancy. Note that there is one very prominent guru whose age at the time of death was around 95; the data point at the top-right corner (GPROM=7, GAGED~95). This happened largely by chance in our data. Nevertheless, assuming that our data somewhat reflects what could happen in real life, the followers of the guru would probably point at that longevity as being caused by the guru’s knowledge about health issues. They would likely be wrong. 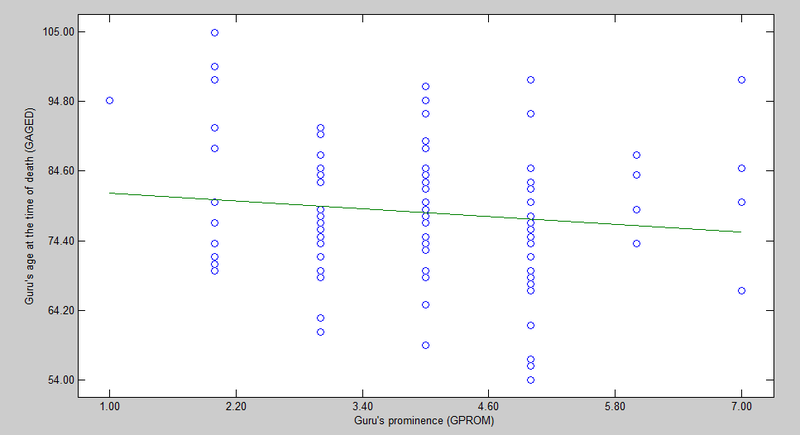 Our dataset also allows us to estimate the probability that a fairly prominent guru (GPROM greater than 4, on a 1-7 scale) would have a below average life expectancy (GAGED lower than 79). That conditional probability would be approximately 60 percent.